VACATIONS are for Father but... Mother makes the plans! In most families planning a vacation is mother's job. Carefully for months on end, she looks for just the right place to give father a good rest. Today Flagship travel brings within her reach many wonderful places never before practical. Long tiring hours "on the road" are the thing of the past. By Flagship the trip is quick and easy. The family arrives rested and ready to enjoy those extra days of vacation. So plan to vacation by Flagship this year. You'll find your holiday starts the moment you board the plane. OH NOW THIS ONE DONE GONE AND PISSED ME OFF. Sorry. I get a little redneck when I get mad. But "Vacations are for father"?! OH I JUST REALLY DON'T THINK SO. I knew there was a reason I never fly American. And Father also gets to decide WHERE he and Mother are going! 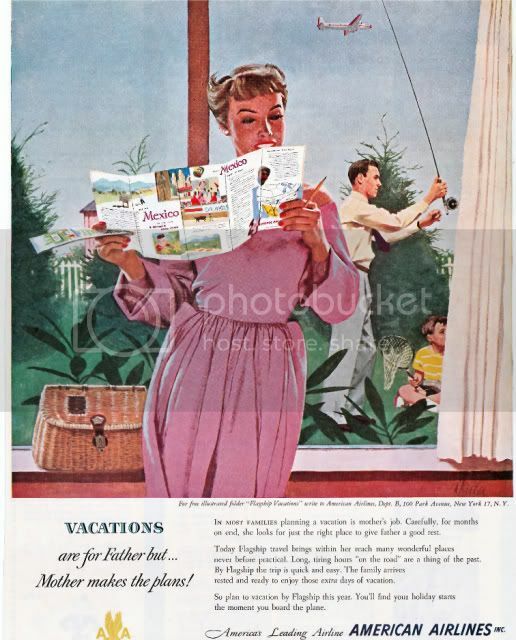 But the best vacations are when Father sends Mother off with HER mother and stays behind with his younger girlfriend. Vacation indeed.